Ensure easy and efficient seasoning at your self-service stations with this Cambro 96SKRC135 Camwear 10 oz. polycarbonate shaker with yellow lid for cheese! This shaker's lid is specifically designed to dispense parmesan cheese with ease. Its yellow color offers instant identification in a color-coded setting, while the crystal-clear Camwear polycarbonate shaker eliminates any question as to the contents. At the same time, this clear construction means your staff can keep an eye on the level of product, ensuring you never run out while minimizing unnecessary refills. This polycarbonate shaker works amazing. It pours out just the right amount of seasoning on our products. Its the best and I would recommend to anyone. This product does a great job of shaking out the seasonings we put on different products. Very sturdy and never wears out with perfect sized openings for any kind of seasoning. This Cambro shaker is great, super strong too, love that the lids are inter changeable and we can swap for others in the same line. The Cambro yellow lid shaker is great for when we do spaghetti night with our member meetings. The yellow lid is perfect for parm. cheese. Nice shaker and yellow lid with larger holes for spices and items that typically get stuck when trying to shake out. Easy to clean and durable. Camwear shakers are the best. We have used them at our restaurant for years and they hold up very well. Even the various lids hold up and still fit after many washings. I use this primarily for dried oregano, and it works perfectly, the holes are just the right size. Lid snaps tightly in place without being a pain to take off when you need to clean or refill it. The Cambro 96SKRC135 is an excellent value and good quality little shaker with a perfect lid for cheese or other larger items. The plastic is thick and durable. The top fits snugly but is still easy to remove. The entire line of Cambro shakers is excellent. We have been using this for a while now. I got different lid for different purposes. Salt, pepper, sugar and sesame seeds. It works. Just watch so it is not so close to the heat. Only had to replace one lid due to split in the rim. The holes on the lid are the perfect size for our sesame, seeds and furikake. The container is big enough so we don't have to refill very often. awesome dredger as well as the other lid/ hole sizes. helps make quick work to season your food items without putting too much on there. This shaker is a great product the holes are the perfect size to allow the cheese to come out easily. Easy to clean and care for. This could have been a great item, but they really need to make the holes in the lid a bit larger for shaking Parmesan cheese onto pizzas. It's well made, but, just make the holes bigger. Thank you for the review! We’re sorry this is not working for what you need it for. We suggest trying this Tablecraft 166D 10 oz. Polycarbonate Shaker with Yellow Lid for Ground Cheese instead. 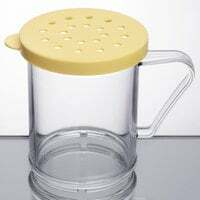 This shaker has larger holes in the lid perfect for parm cheese or even shakes on sesame seeds. I'm sure you could find many uses for this shaker. We use this shaker for parmesan cheese. It works great and is easy to clean. I like that it comes as a set with the lid rather than having to purchase separately! The holes in this lid are perfect for grated Parmesan. I use this for garlic Parmesan fries and a couple of shakes does the trick. Makes everything faster in my food trailer which is great cause we are always trying to shave even seconds off a order. Cheap enough to replace every year or even every three months but they will las a lot longer as long as you don't drop them ten times a day. Happy with my purchase. These work great for our shaking needs. We use it for ground cheese and some spices. Does not hold a residue and are easy to clean. Great quality classic cheese shaker at a better price than some of the other brands. Being able to get different style lids makes it great to be able to wash everything and not worry about which lid goes with the right container. Wasn't sure if this was going to work for what we need it for but it does. Used to shake rainbow sprinkles on to lattes and it works just fine. We use these in our Pizzeria to sprinkle Italian Seasoning on top of all our pizzas before we bake them. These are inexpensive and PERFECT! Got it from here! The price was so right! Only 2 and change! We use this for grated cheese! Customers love them ! Easy to clean too. Very useful product. It didn't even took that long to ship. I would say like about 2 days on the "3-5 days shipping option. Great job guys! We love these and use about 8 different shakers daily. We put everything from oregano to parmesan cheese, to taco seasoning, to garlic and more! These are a must have for any place making pizzas and using Parmesan cheese. We use these in the back to sprinkle cheese on the bread sticks. They get the job done and do not clog up easy as well. We use them on the line itself and they are able to take a beating. we did this for a popcorn cheese shaker for a truffled parmesan popcorn. It worked well, very easy to refill and to keep clean in a fast paced setting. We use these shakers all the time for various things. This one with the bigger holes works good for powdered sugar. Easy to clean too. I was tired of the metal cans where the lids get stuck so I bought a few of these. Theyve been through several washes and they are holding up very well. Easy to refill on the fly. These shakers allow grayed cheese to come out very easily. They are also easy to clean and will not shatter if someone drops it on the floor. Great shaker, holds a great amount of dry spices. Can change out the lids for smaller lids. Easy to store and wash. Easy refillable product. These are very nice shakers. This particular style of lid we use for oregano as any other size is just to small. Have had these for sometime now and have yet to break any of them. We use these shakers for our bagel toppings. Poppy seeds, garlic, and course sea salt shake perfectly out of these lids and they are easily cleaned too! A good all round shaker that you can run through the dishwasher which makes for quick sanitation. The pop off top allows you to change the size of your holes with ease. We purchased a few of these to use for grated romano cheese and they work as advertised. No problems at all with this product. Will pick more up in the future. It was hard in choosing a shaker with so many variations of hole size and unknown proportions. However, this allows for a 'medium' dousing of standard size flavorings [ sea salt, table salt, cracked peppercorn, etc] This unit, unlike others, is easy to clean and remove the top for a quick refill during operations. A best buy in my opinion! This shaker is very useful though lacks in quality. It is made of hard plastic. However, the uses are endless. Fill it with cheese for pizza, powdered sugar for french toast, cinnamon sugar, spice mixtures, and pretty much anything else. The shakers are perfect for holding cheese, crushed red peppers, sesame seeds, oregano, etc. The lids holes are too big for salt or peeper so get the finer lids as needed. A good little shaker. Normally we use this for a salt/chilli powder mix on fresh made nacho chips. Holes in the top are perfect for this.